Sculpture at the California Vietnam Veterans War Memorial in Capitol Park, Sacramento CA; photo by Scott Jones on Flickr (noncommercial use permitted with attribution / share alike). From The California Vietnam Veterans Memorial; "The California Vietnam Veterans Memorial is located in the north-east corner of the State Capitol grounds at 15th Street and Capitol Avenue, Sacramento. It is found near the Rose garden in a quiet, lush setting. Wide, paved paths lead to the Memorial from the street as well as from the rest of the Capitol grounds. There is a large grassy area around the Memorial, with benches scattered around the area. The Memorial is circular in design, with full relief bronze sculptures depicting scenes from daily life during the war. The sculptures represent many sides of the war, with grunts, nurses, and POWs. The American flag waves over the Memorial. The 5,822 names of California's dead and missing are engraved on twenty-two black granite panels, arranged by their hometowns. In a ring arranged around the granite panels, there are stone benches facing the names." (a) California has the largest United States veteran population in the nation, comprised of approximately one million eight hundred thousand armed services veterans, which is 8.3 percent of the nationwide veteran population of approximately 22 million veterans. (b) More than 350,000 California veterans served in Vietnam, resulting in 5,822 killed or missing in action, which comprised more than 10 percent of the nation’s total, and 40,000 wounded. (c) More California residents died in Vietnam than residents of any other state and California veterans received more Medals of Honor, Bronze Stars, and Purple Hearts than veterans of any other state. (d) The history of the California Vietnam Veterans Memorial began when Herman Woods, a double amputee who served in the 1st Air Cavalry Division, United States Army (1970), returned to California from the dedication of the National Vietnam Veterans Memorial in our nation’s capitol, Washington, D.C., in 1982. (e) Assembly Member Richard Floyd subsequently held a rally on the steps of the State Capitol and over 800 people attended; he was convinced that construction of the California Vietnam Veterans Memorial was the will of California Vietnam veterans. (f) Assembly Member Richard Floyd introduced Assembly Bill 650, which created the California Vietnam Veterans Memorial in Capitol Park, and was signed into law by Governor Deukmejian in September 1983. (g) The newly formed Vietnam Veterans Memorial Commission was comprised of nine veterans, eight of whom served in Vietnam, including Linda J. McClenahan, Chairperson, Leo K. Thorsness, Medal of Honor recipient and Vice Chairperson, and members Gregory C. Green, Treasurer, Abel A. Cota, Secretary, B.T. Collins, Don A. Drumheller, Jesse G. Ugalde, Senator Jim Ellis, Assembly Member Richard E. Floyd, member and author of Assembly Bill 650, and Jerri L. Dale, Executive Officer, which led to the creation of the California Vietnam Veterans Memorial. (h) The California Vietnam Veterans Memorial is located in the northeast section of the Capitol Park grounds of the State Capitol and is a standing tribute to the 5,822 servicemen and servicewomen killed and missing in action. (i) The California Vietnam Veterans Memorial was dedicated on December 10, 1988, in Capitol Park; there were thousands in attendance at the dedication ceremonies where Brigadier General George B. Price was the keynote speaker at the dedication; and the dedication events were spread out over a two-day period, commencing with “Buddy Search” registrations, unit reunions, open houses, and concluding with the dedication ceremony in Capitol Park. (j) The theme of the memorial reflects the overwhelming majority of those who were killed in Vietnam, including 19-year-old infantry soldiers, their youth, camaraderie, the fatigue of the war, and the American women who served, with the winning entry in the opening design competition awarded to Michael Larson, a Marine Corps Vietnam veteran, and Thomas Chytrowski. (k) B.T. Collins and Stan Atkinson, who had traveled to Vietnam together after the war, undertook the mission of raising the necessary funds to complete the memorial. 429.9. 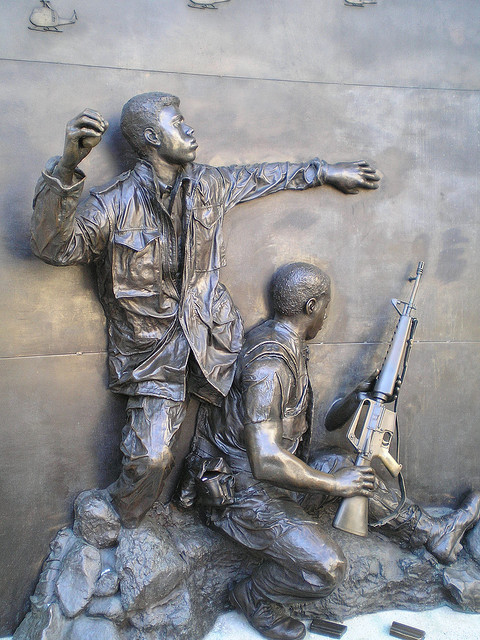 The California Vietnam Veterans Memorial is the official state Vietnam veterans war memorial.